Ultragrip LP | Hawk Research Laboratories, LLC. 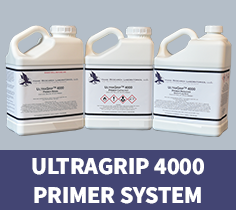 Considered the premier primer system in the resurfacing industry, UltraGrip 4000 primer is a 2 component, polyamide cured, high-build primer system for a wide range of substrates, from tubs and tiles to floors and countertops. UltraGrip 4000 primer has a fast cure even when applied at heavy film builds. It covers minor surface imperfections and seals grout lines on tile walls and floors. Mix 1:1 with UltraGrip 4000 Catalyst and reduce as necessary with UltraGrip 4000 Reducer. UltraGrip 4000 primer is available in white, as well as tinted colors for our StoneFlecks™ Ultra multicolor topcoats. 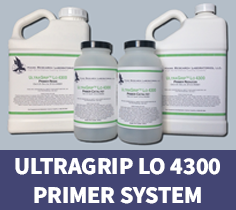 UltraGrip Lo 4300 is a two component, low odor, low VOC, fast dry primer system. UltraGrip Lo 4300 has a total VOC less than 100 grams per liter when used at the recommended mix ratio, and is compliant with the most stringent coatings regulations for primer systems. It is a polyamide cured epoxy system specifically designed as a high build, high tack intercoat adhesive for all Hawk topcoat systems, providing excellent adhesion over a wide variety of substrates.